…Thy neighbours will always be poisonous flies; what is great in thee- that itself must make them more poisonous, and always more fly-like. When politics fails to find answer, philosophy offers the way. A noise in the aftermath of a disgusting crime is unavoidable. However, too much of noise has its own problem. It drowns saner thoughts and it falls on its own head. Two soldiers have been martyred and beheaded on the border. Pakistan’s infamous BAT division infiltrated, attacked, killed and mutilated the bodies of two Indian soldiers in Poonch of Jammu and Kashmir. This was not the first time. In the year, Pakistan Army assisted HuJI terrorists led by Ilyas Kashmiri, killed and beheaded an Indian soldie, Bhausaheb Talekar. This was followed by similar mutilation of the bodies of Lance Naik Hemraj and Lance Naik Sudhakar Singh. Captt. Saurav Kalia was martyred and his body was also received in mutilated condition during Kargil war, in which Pakistan first attacked, then denied being part of it, and having lost the war, refused to take the bodies of its fallen soldiers. Captt. Kalia’s father is fighting a lonely fight for the dignity of his martyr son, while Government refuses to be party in raising the matter in International Courts of Justice. I was much moved by the sad incident of the beheading of Lance Naik Hemraj and Sudhakar Singh which became my story “The Death of a Soldier” in “The Rude Tenderness of Our Hearts”. It is easy to reject an argument by converting it into a ridicule. If one is of saner mind and understand the fall-out of war, one can easily find this in TV debates. There is always a human cost in war which can neither be predicted nor measured. The outraged souls are getting silent, the nerves are getting numb. This has been happening repetitively and routinely on our North-western borders. Such cruelty is not alien to the culture to which the west ceded to when it refused to be a part of secular India, in 1947. We find it in Battle of Badr, we find in the bloodiest of battles for supremacy till the fourth Caliph. We also find it in the aftermath of Afghan and Mughal invasion. We cannot wish this away, not until Pakistan walks into the modern world. When it happened last time, Indian Army attacked into Pakistan territory in what we called surgical strike. Congress claimed this was earlier also done but to quote them, they never went chest-thumping about it. A just war has glory linked with it, an unjust war is unholy and one perpetrating it carries it always it always as a stigma. By not owning the earlier strikes, if they did happen, the then Government had left Army to live with a lonely stigma. The line between courage and cruelty, bravery and brutality is very thin. Shame it the indicator of justice attached to an act. By not acknowledging and owning the act then, UPA government had made a conscientious Indian Army, known and respected the world-over for impeccable credentials of gentlemanly conduct, equal to the rogue army of a failed nation. The NDA- Government on the other hand, by owning the surgical strike gave the Army action a great legitimacy. After a brief breather, now again the attack happened, which left us with a shattered nation, a battered spirit, a grieving family and headless bodies of two brave martyrs. There is one very important differentiation between Indian and Pakistani population. The intellectuals there invariably side with the Government. On Indian side the divide is wide. We have strident voice urging for stiff and urgent retribution, on the other hand, immediately after every attack, military or otherwise, from Pakistan, rises in India a voice which cautions any action and almost apologetic about our existence. Those who do not want action, want to quickly move back to business as usual. For them two dead soldiers is nothing but a number. Much like what Pakistani soldiers are to Pakistan. We have seen the state abandoning the Pakistani soldiers earlier in 1971 and later in Kargil. But they are very wise. By faulting military action, position as war-hating peaceniks they obtain a moral higher ground and use it to abandon any action. Military action is not a response to Pakistan. It will meet not result. This we have seen with earlier much touted surgical strike. Those of saner minds would know that and are not even asking for it. Military actions have an inherent tendency of spilling out of control quickly. The futility of it is evident in the latest act of brutality after previous strike. Those who want Pakistan to get away with this crime, are the quickest to convert this demand for action into demand for Military action. Military action is not a substitute for diplomatic action and political will. When Military action happens without the civil establishment moving in consort with it, it seems that the nation has almost disown the military. It makes Army appear like bad boy of the family, who somehow brings bad name to the family. This is unfair on the part of Political establishment. Every time, we engage with Pakistan, we lift the sham of the nation upwards. We allow for hyphenation, we allow the world to look at us as Indo-Pak. There is no such thing as Indo-Pak. We have carried this absurd baggage of common origin from Partition for far too long. Pakistan was carved “out of” India in 1947. It is absurd to believe that the two came into being in 1947. India is an ancient civilization, even though Macaulay-descendants would want to make us believe otherwise. India is world’s largest democracy, a civilized present with a civilized past, while Pakistan is a failed nation which travelled from one military dictator to another; India houses a religion as majority which does not dream of setting the rule of temple across the world; Pakistan is hotbed of Jihad; India is world’s third-largest economy of more than Trillian Dollars, Pakistan is a geography with GDP of around USD 230 Bn; India is known worldwide for intellectual prowess, Pakistan is known worldwide as fountainhead of terrorism. There is no equivalence. This continued dialogue, continued surrender of India into a hyphenated situation emboldens Pakistan to consider itself as an equal to a nation which is many times larger than Pakistan in all respects. If anyone was to listen to me, Military should be given a free hand to respond to the Pakistani misadventure, but then for Pakistan, where Army sells Kirana and harbors international terrorists like Osama Bin Laden, and where hundreds get killed by their local terrorists in suicide bombings, the life of soldier means little. It would be naïve to believe that a nation whose sense of pride has been numbed and badgered over four lost battles would be ashamed and shocked to desist from acting dishonorably in the future. Many veterans might come on TV and talk about avenging two heads with ten, some with twenty, depending on their anger and frustration. It makes for a good fiery debate, but then international relations are not same as defense relations; latter only form a part of it. They talk about what we should do with Pakistan, but they talk about what we should do with Pakistan militarily. Army action should not be used as a safety valve to release the pressure of citizens’ anguish. It must not relieve the civil leadership from taking necessary non-military actions. Without which, it is just a guess as to what would be the right number of heads to be taken as revenge which could deter Pakistan for such future misadventure. I am not a political analyst nor a military expert. But I look at things dispassionately and find that only thing that gives Pakistan courage to keep on hitting above its weight is the fact that we treat them as our equal in political discourse. - Scrap MFN (Most Favored Nation): Some people tell me that we cannot do so because we are part of WTO Agreement. That argument is so flimsy. US is a member of UN and considered to be important inspector to control Arms across the world. It does not restricts US from trampling over other nation’s sovereignty and Bomb them with impunity. We are merely digressing from a global trade treaty with respect to a nation which is a declared enemy nation, and who has on its part not reciprocated the MFN. Now don’t tell me that MFN is binding on us and not on Pakistan. Some say, MFN is just notional and means nothing to trade. If it means nothing, why Pakistan has not reciprocated it? That is because, to my mind, Pakistan leaders use it to prove to their people (who moved from India to Pakistan out of distrust and hatred towards their then-fellow citizens in undivided India in 1947) that their hatred and enmity towards India cannot be countered by some global treaty. Indian political leaders should scrap it for the same purpose- to reciprocate the hatred, which Pakistan demonstrate by not granting MFN to India. - Exploit the Indus Water Treaty: I do not advocate India to come equal to Pakistan in barbarism and inhumane behavior, but we must make use of what it justly ours. If that troubles Pakistan, so be it. If they want to go to international fora crying, let them. They do it anyways. - Abrogate Article 370- There is no reason for Kashmir to have special status. Dr. Ambedkar who gave us the constitution and behind whose name the leftist and break-India campaigners hide, was dead against it, so much so that he refused to draft it. It was drafted under the presumption and with insistence of Kashmiri Jawaharlal Nehru to give time to Kashmir to decide to join Indian Union, even when then King of J&K had acceded to India while under attack from Pakistan attempting to forcefully acquire the territory in 1948. Seventy years is enough time for the locals to think it over, and in these 70 years we have lost major Part of Kashmir to both Pakistan and China. Whatever is left with us, we are losing to Islamic Jihad. We must scrap 370, break J&K in three divisions as Ambedkar had suggested and isolate the valley, before the disease spread. It has already spread miles away to places like JNU in Delhi. We must end 370 to stop the narrative where Kashmiri leaders what India to win their hearts and minds. They never say that they want center to win them over, they want India to win them over, as if the small valley was an independent nation, not an Indian state. When they defend status-quo on Article 370, they quote Constitution of which Article 370 is a part and they forget Kashmir’s constitution which says Kashmir which is integral part of India. We must ensure that post division, the central resources are spent proportionately in each of the division, instead of valley hogging it all like the pampered, errant child. - Reduce Diplomatic engagement to bare minimum. Send the Pakistan High-Commission staff back, shut down the Pakistan High Commission. We must call be Indian ambassador. The world will be shocked, or will pretend to be. This world doesn’t get shocked over missile attack by the US in Syria, nor does it get shocked by the dropping of Mother of All Bombs in Afghanistan. The world is not left with any moral standards. Dropping diplomatic relationship with Pakistan will be the most humane response India can offer to Pakistan for its inhuman enmity towards the nation from which it was carved out. Wipe that smirk of Basit’s face. - Seal the borders, end trade with Pakistan. No people to people contact is needed. We need to stop pretending that India and Pakistan are partitioned like East and West Germany. Their division was ideological, philosophical. Our partition is religion, it is red with blood. Let their hatred cool down. Let us stop struggling between Good people, bad Army. It is their problem. Let them sort it out internal before we engage with them, again. 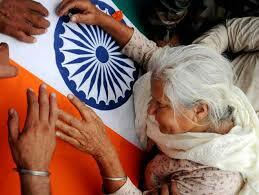 - Seek International intervention on the matters like barbarianism towards Indian soldiers. The argument that seeking international intervention will allow Pakistan to raise bi-lateral matters like Kashmir internationally is flawed and useless. Not going to International Court of Justice has not prevented Pakistan to raise Kashmir at the UN, nor did it prevent the Islamist Caliph Erdogen from advising India on Multilateral intervention to resolve Kashmir. Since our inaction on honor of soldiers is not dissuading Pakistan from internationalizing bi-lateral issues, why not bloody-well stand for once for our fallen. As you would see, none of the steps which I propose are Military. However, there are paid interest groups, who would not want these non-military actions to be taken. They would therefore turn any demand for action into a demand for armed action and thereby defeat the demand by siding with peace against war-mongers, latter in reality, fictional invention of the liberals. I do not advocate war with Pakistan. I advocate shutting down of sense towards Pakistan. I advocate that India should treat Pakistan as a non-entity, as a black-hole of uncivilized barbarians on the borders, with whom even if we share the language, we must not share a word. We must drown them with our abominable apathy, our incessant ignore, our rigid disregard. Let us break the Indo-Pak hyphen and throw back Pakistan into the irrelevance it richly deserves as an Eighteenth-century nation in a Twenty-First century world. There are people who keep on advocating dialogue. There is a whole industry built around it. This industry will dry up once we erase this rogue nation from our national conscience. Our problem is we talk too much. When words are superfluous, silences carry the messages. As I said, when politics fails, philosophy answers. It is not for the great nation of ours to be a flyswatter, as Nietzsche said.